Built with side and under boiler water tanks (right front fill). Note: The roster notes this company as owning two Davenport geared locomotives. This one at 24" gauge and the other (c/n 1859) at 36" gauge. It is unknown if this is an error in the roster or if the company had two railways with different gauges. G. B. Railway #2 - c/n ? This image appeared in an advertisement on page 146 of the November 6, 1920 issue of American Lumberman. Since this company name does not appear on the Davenport rosters we have, we are uncertain if it ever exited or this particular locomotive was built. However, the fact that images of other Davenport geared locomotives appearing in other publications have been located in our rosters, lends credence to the possibility this was a real company and the locomotive was built. Since the image appeared in a lumber related publication, if the company exists, it is probable it was in or related to the lumber business. Please e-mail us if you know complete of this company and/or locomotive. E-mail me if you know what the "H. A." represents in the name. 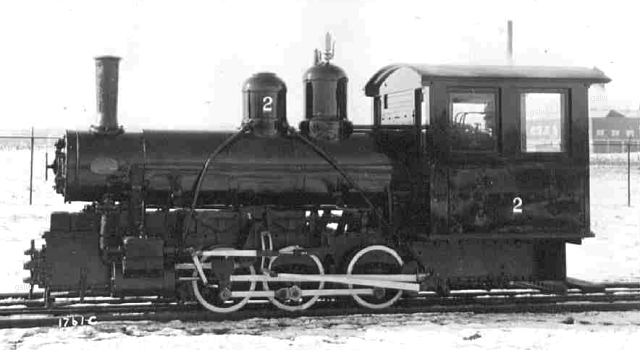 Two 24" gauge, 0-4-0T locomotives were built for this company on 1/1922. They were c/n 1809 & 1810. 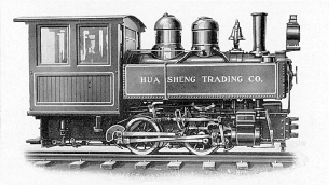 This image appeared in "The Tenth Edition Davenport Catalog" without specifically indicating which locomotive it represented. Note the 4 wheel trailing truck beneath the entry door of the crew cab (barely visible). 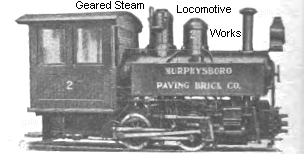 The image appeared in the October 4, 1922 issue of "Roads and Streets"
0-4-0T with "front fill" under boiler water tank.